a1decoy_uk has no other items for sale. The Cobra microTALK MT975 Twin two-way radio is the right solution if you need to communicate over a large indoor and outdoor area. This portable/handheld device is designed to provide reliable and trouble-free performance whether over long stretches, short distances, or through building walls and floors. In addition, the 8-channel model is equipped with features and functionality such as CTCSS, DCS. We are happy to provide a combined postage discount wherever possible; this is at our digression and is not guaranteed. Discount depends upon each item, delivery location and delivery service selected. If this discount is not automatically applied by ebay then please ask us for a revised invoice before payment. We can not provide this discount after you have paid. Payment for all items is preferred via PayPal. By clicking "Buy it Now" or paying for an item you agree to these terms and conditions. By completing and submitting the electronic order form (or proceeding through the 'checkout process') you are making an offer to purchase goods which, if accepted by us, will result in a binding contract. Neither submitting an electronic order form or completing the checkout process constitutes our acceptance of your order until delivery of the product had been made. If the order is not accepted a full refund will be given or an alternative product offered. If paying via a cheque or postal order, please make it payable to “A1 DECOY” and sent to the following address: CHESTNUT HOUSE CHESLEY HILL WICK BRISTOL If you BS30 5NE We constantly strive to recycle as much packing material as possible, this is good for the environment and keeps the price as low as possible for the consumer. This includes using pre-printed or reused boxes as well as using shredded packing material such as cardboard, paper or foam to protect your items during transit. Excellent Bits of Kit! I have several! I've used these as my standard 'site' radios for about 5 years, and when running teams of beaters on various shoots. For The site work (we're sand blasters) they stand up very well - eventually the screens do get a little scratched; and this year's winter weather has caused me problems on the shoots - killed a couple of the older machines with rain - but it was very very wet! The only other thing to be aware of is that I have had issues with 'non-UK' MT975s... recently bought a pair from Spain as they apparently offered the best value... suspect that the frequencies uses are subtly different. They work fine together, but not well with my existing machines - the call button definitely seems to use a different frequency for example. These are rubbish walkie talkies only go about 300 yards,i bought these because it says it go's over 7 miles, would be OK in a factory or somewhere in the same place,they are no good for long distant as described,i bought cheaper one's one time which went a lot further and worked in a built up area,so don't waste your money. A great product, with all the features you'll ever need. Go buy them! I bought these as a Christmas present for my 9 year old daughter, who is going through a massive James Bond phase. 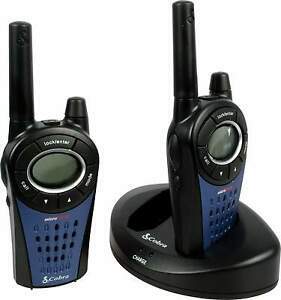 After using these radios extensively, I would thoroughly recommend them. As with all PMR radios, you don't get anywhere near the stated range (12km) in typical usage, but the packaging and manual does make this very clear. In a heavily built up area, the range is probably around 500-800 meters. In the open (across the sea), we saw good signal at just over 5km (which is very good for a 0.5W transmitter). Speech quality very good, the display is clear and legible, and they feel very nice in the hand. As a bonus, you get a charging stand and 8 NiMh rechargeables. There are a number of extra features, such as 'VOX', which makes the handsets go open mic when someones speaks, instead of having to press the 'transmit' key. They can also work as a baby monitor. All in all, a great product for very reasonable money (approx. £30). A couple of years ago I bought a pair of these walkie talkies. They were great. So I needed a couple more sets for remote locations and it looks like the charging circuit has been changed so that the units get one fixed charge period and the charger then turns off. Unfortunately this means that if you leave the units in the charger base they end up flat. The orginal pair I had didn't do this. If you take them in and out then all is well and they charge. I think I'll have to make a box that interrupts the supply once a day so that they stay charged.